Official handover of the tallest Croatian statue of Mary, Mother of God, 14.08.2011. Croatian charitable society CRO UNUM organised the official handover ceremony of the statue of Gospa od Puta s djetetom Isusom (Our Lady of Travel with baby Jesus) to the Šibenik diocese. 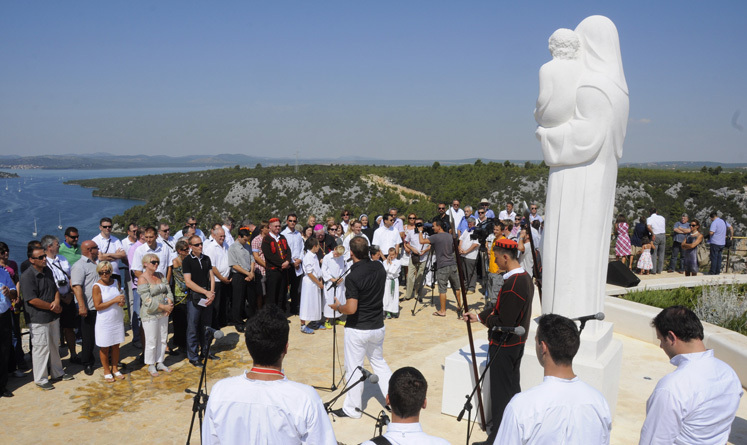 Ceremony was held at the location of the Krka resting stop on the A1 Zagreb – Split freeway. Handover ceremony was attended by numerous distinguished persons amongst which were the diocese troup of guardians of Jesus’ tomb (Žudiji) from Tisno lead by their commander Frane Lučić (only surviving firefighter from the Kornati tragedy), Alka knight Ante Zorica (winner of this year’s 296th Alka tournament in Sinj) as well as numerous members of the CRO UNUM society including famous Croatian athletes Dario Šimić and Franjo Arapović, musicians Mate Bulić and Alen Nižetić, actor and entertainer Slaven Knezović, representatives of Veteran’s associations from the whole country and a string of entrepreneurs, scientists, cultural and education workers, representatives of the Church etc. Entertainment program was enriched by Alen Nižetić, musician who is also a member of the CRO UNUM society, brass band of the Cultural society “Hartić” from Tisno lead by their conductor Dino Obratov and Klapa Fjabula. During the short ceremony, President of the CRO UNUM society, Prof.dr.sc. Dragan Primorac presented the official donation deed to the Bishop of Šibenik Ante Ivas who used this opportunity to note that the diocese of Šibenik is overjoyed to receive this gift and it will surely guard and nurture it. Bishop presented a special gift to the CRO UNUM organisation, a rosary from Pope Benedict XVI which was given to the Bishop during Pope’s last visit to Croatia. With this act, Bishop wished success and many high quality projects in the future for CRO UNUM charitable society and all its members. The statue of Gospa od Puta, (it is 3.5 m high and weighs 8 tonnes), is the tallest statue of Mary, Mother of God in Croatia and it it the work of sculptors Prof.dr.sc. Kruno Bošnjak. Veno Jerković and their associates. This project started over four years ago, and it was completed on August 14th 2011, one the day before the Assumption of Mary (including final landscaping works on the accompanying garden and plateau). All of this was financed by the donations of members and friends of CRO UNUM. Posted on Thursday, September 1st, 2011 at 12:31 pm. Filed under: novosti-en RSS 2.0 feed.